Alabaster is harder than soapstone and has a beautiful soft look when finished. This sculpture was created on commission for Morgan as a gift to her parents celebrating their anniversary. It represents three birds ascending upward in flight, overlapping to support one another. This piece was carved from a disc that my father brought back from a trip to BC. It is based on an eye wide open with spiked eye lashes but also hints of earth's horizon with the sun rising beyond and clouds in the sky. 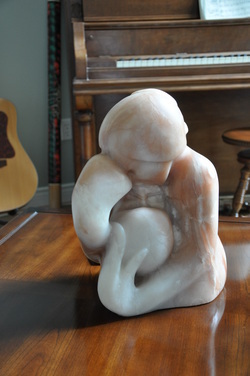 Memories, carved in pink alabaster is of a woman remembering the kiss of her lover. The traditional family consists of a mother holding a child in her arms. The two of them are so entwined that their forms become one, with smooth gentle curves. The father's role is to provide protection but his form is sharp and unattached to the mother and child. This sculpture (8" high) was created before I had children of my own and the distance between the father and the rest of the family helped me determine that my family structure would be different.